Sales of any product or service can be classified into different and broad categories, need or desire, planned or impulsive, demand and supply; and the simple yet complex human mind has to resolve conflict and make decisions. The mind knows what it wants, yet spends time to see if the decision is right or whether change is needed, whether online or offline. Today, the competition between online and offline is getting heated up and the centuries old rule of offline has just been taken over by the new kid on the block i.e. online. Digital marketplaces are replacing B2B sales; e-commerce is replacing offline stores. A human being short on time, being very price conscious wants an at home, stress-free shopping experience and online is beating offline experience hands down. So, then what is the future of retail, what is the future of exhibitions and what needs to change for it to work? Let us first try and understand the human mind, the buyer’s mind. Stimulation is an important need of the human emotion, a trigger that is needed for someone to be happy, excited, convinced enough, to take the next step. Whether it is a new human relation or a product or service, the emotional connect is an important tool. The six human senses of touch, hear, smell, sight, taste and mind; play a very important part in the decision making processes of an individual. The sixth sense which is the mind, of course here its logic, price, need etc. It is said that the number of senses stimulated is directly proportional to the odds of sale. Therefore, if more senses are stimulated, then there is an increased probability of the human mind to be stimulated enough to BUY. All things considered – and assuming that the mind or need or impulse or pull of marketing and branding is the same for both online and offline – we will go online if we want to buy something or see what the options are, similarly we will go to the mall or a store to see what is available or what the options are. Advertisements and pop-ups on social media sites tempt buyers towards online shopping. Similarly, all the hoardings and glow signs, or a trip to the mall for a movie or dinner might pull the buyer into a good-looking store. These are examples of impulsive online & offline buying, hence, the human mind is equally convinced or is tempted by both the mediums. The only difference being the time that we spend on each medium. Hence, barring time and interest on the medium, the sixth sense is equally inclined towards offline and online and for argument purposes can be put aside and on the back burner for now. Out of the other five senses, smell and taste indirectly influence the buyer’s decision. These two senses can be infused in a buying experience through a nice smelling ambience and with something to stimulate the taste buds, like chocolates or nuts. Both of these make the customer feel at home, be part of an environment that he doesn’t want to leave. While such an experience can easily be provided offline, an online platform lacks the power to stimulate these senses. The temperature, the lighting, the shade, the smell, the neatness and hygienic environment contribute to an experience that can be created in an offline space whether retail or wholesale, whether permanent or temporary at an exhibition. These two senses can stop the sale if they are not proper or are incorrectly used or ignored. can rotate the product 360 degrees in person. Add to this the element of touch and feel, are the third most important sense. And the combination of the 3-dimensional view with the feeling of touch cannot be matched by online sales. Online sales will just be reduced to products that you have used or had or are needed for your daily use. The new products, the new styles and looks will have to be touched, felt and experienced . Online can only help the customers to be pulled for the experiential sales, which can only happen OFFLINE. If all the above is the case, then why is offline losing gross sales and online growing at such a rapid pace? Why do we have people moving from offline to online presence? What is not right or is wrong? Well one reason for this might be the convenience of looking at multiple products and comparing them with each other on all specifications and price at an online platform. Specially in the case of branded products it is very easy, as the element of trust is taken care of and the touch or the view or sales pitch are not that important. How can offline deal with this in addition to stimulating the senses is the million-dollar question? And the answer lies in exhibitions or malls of all products of one kind or type under one roof or one area. Before India can create permanent product wise shopping areas for both wholesale or retail, temporary structures or exhibitions are the way forward and are required. One mega roof, all competitors, all products of similar type, and comparison on all parameters; with an added advantage of the freedom to negotiate, bargain, get some extra freebies of accessories or services and go home happy and elated. The new business model of having permanent exhibitions at one place in every city with rotation of various products or commodities is a viable and working future for our industry. See how Hong Kong or Mainland China or Messe Hannover or Frankfurt or Las Vegas or Dubai or many other cities across the world are monopolizing on this. It’s about time, we in India, created consolidated venue or semi-permanent venues which are easy to exhibit at, visit and are near big cities. Let’s make success out of offline exhibitions and give everyone a hands-on experience of selling and buying. 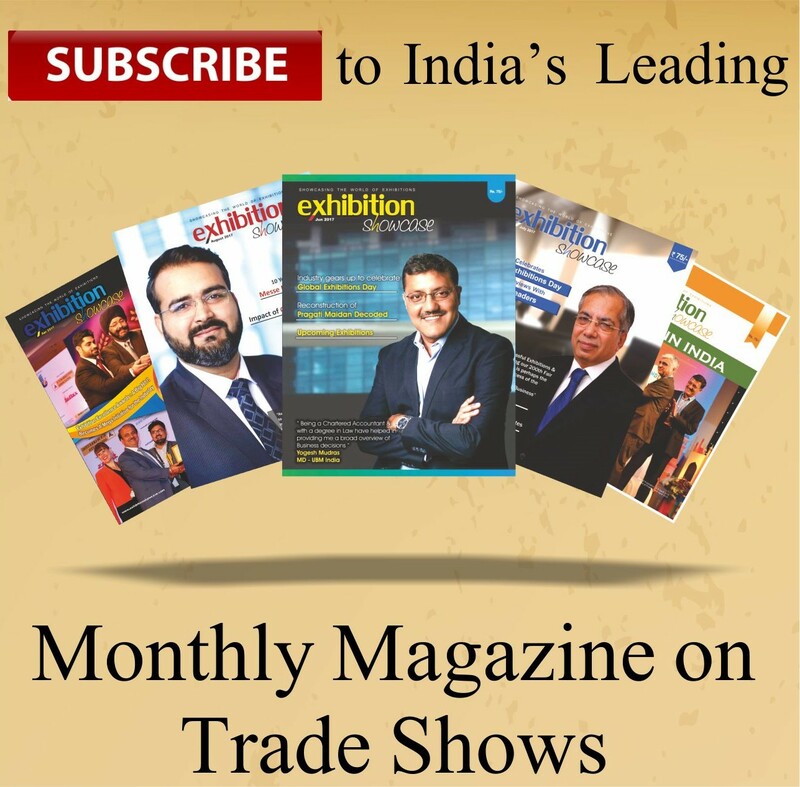 Wishing the best to the future of the exhibition industry in India!